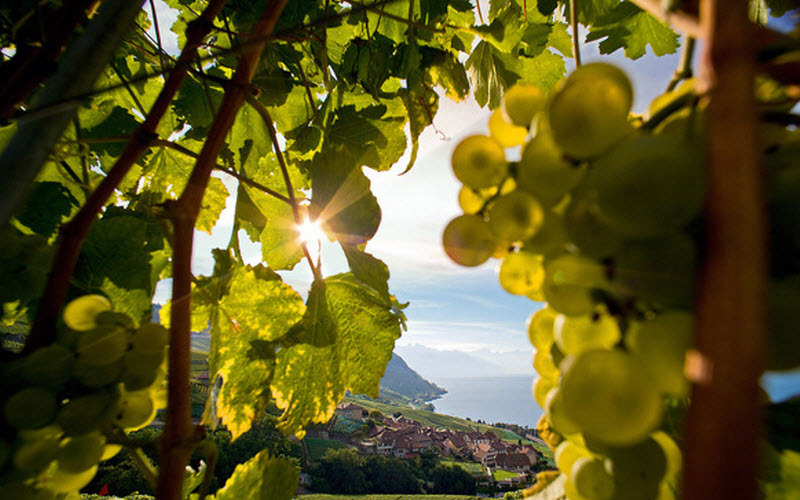 The Chasselas is the image and the identity of the Switzerland culture. In most countries the Chasselas is a table grape but in French-speaking Switzerland we make a fruity, fresh and delicate wine with it. The Chasselas – The king of vines – is the typical white vine variety of French-speaking Switzerland. In Valais it is named Fendant because its grains crack under the tooth. In German language it is called Gutedel. The Chasselas asks for a long work both in the vineyard and in the cellar. It evolves over time always looking for harmony between the plant, the methods of culture and the environment. He adapts itself while asserting its typicality, its balance and the elegance which characterize it. 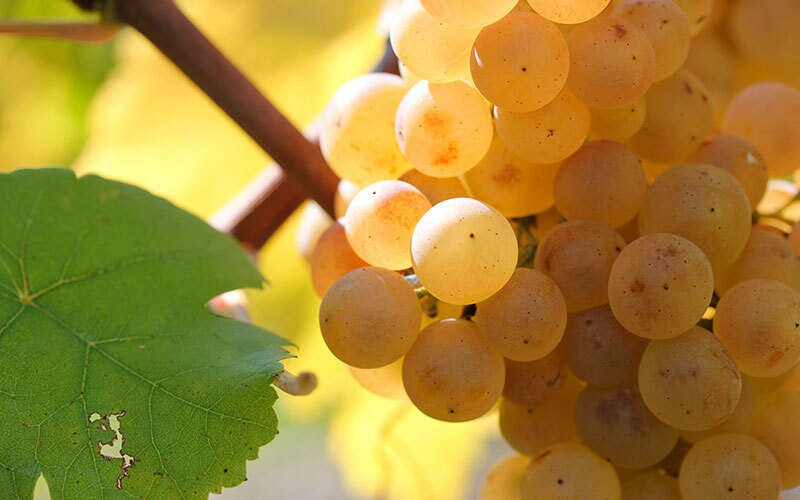 In our weather conditions the Chasselas supplies fruity wines representing all the degrees of wealth: from light and very drinkable wines until the strong and alcoholic characters of some Fendant, Dézaley, Mont-sur-Rolle or Yvorne. It is easy to recognize the Chasselas: copper-coloured bud, long tendril, cluster average in big and compact, round green-yellow grains becoming golden with the sun. Its premature maturity serves as basis for the maturity of other vine varieties. The picking takes place in September and October. According to regions it can be fruity, floral, typified soil, slightly mild. In great vintages, after five or ten years, it has aromas of honey, scents of walnut and a smooth texture which give it a remarkable personality. The Chasselas is marvellously advisable for the aperitif and in the accompaniment of meals. To eat cheese fondue, raclette, vacherin Mont-d’Or cheese, trout, fera or fillets of perch without Chasselas is unthinkable. The Chasselas was denigrated for years, presented as a wine without virtue and without future. Even professionals slandered it and gave it up. To such point that the federal authorities favoured the lifting of Chasselas by subsidizing the wine growers who planted more qualitative vine varieties. So surfaces planted with Chasselas decreased strongly the last twenty years, mainly in Valais where they cover less than 1000 hectares today. Fortunately the Vaud wine growers did not follow this trend and this magnificent vine remains majority. Today, we attend a real renewed interest on behalf of all opinion leaders. Promotional actions are undertaken to make its exceptional qualities and its originality known. See the very beautiful work of the German-speaking journalist Chandra Kurt – Chasselas – de Féchy au Dézaley, a supernatural journey in the discovery of the treasures of the vineyard vaudois published in French and German. The success of this book makes that it will be translated in English. Another book is written by the famous wine steward Jérôme Aké Béda, Les 99 Chasselas à boire avant de mourir. It speaks of the enormous potentiality of ageing of this wine, quality which nobody praised previously and that explains the reasons of the return to grace of this wine. Let us not forget the magnificent movie of Florian Burion, Chasselas forever, where along a fascinating hour, scientists, historians and wine growers lift the veil on the origin of this symbolic vine of French-speaking Switzerland. It is a technically exceptional work which plunges us into the history of Chasselas. Also let us mention the leaflet of the Office des Vins Vaudois, In Chasselas veritas, which describes and incenses this vine variety. An importing actor it is the dynamics committee of the Mondial du Chasselas, the competition that lived this year its fifth edition with an increasing success. This international tasting gives not only award medals but celebrates the glory of this vine and promotes the Chasselas in Switzerland and abroad also. This return to grace of our vine can only delight us. This wholesome and perfectly deserved revolution of which the first winner will be the Vaud wine growing.